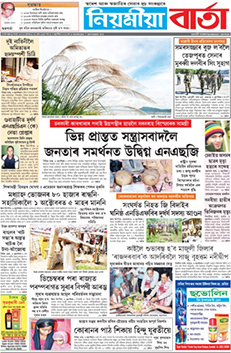 Niyomiya Barta (Assamese: নিয়মীয়া বাৰ্তা) is one of the fastest growing Assamese newspapers. It was launched in March 2011, and is highly respected because of Homen Borgohain, the Editor-in-Chief. Naresh Kalita is the Editor, while Amal Das is the Executive Editor. It has four editions --- Guwahati, Dibrugarh, Biswanath Chariali and Goalpara. Niyomiya Barta is owned by Pride East Entertainment Private Limited, and the headquarters is in Guwahati. The group also owns News Live, a popular satellite news channel in Assamese.